Having a holiday crowd over at your house? Here's a simple dark chocolate fudge recipe to delight the masses. 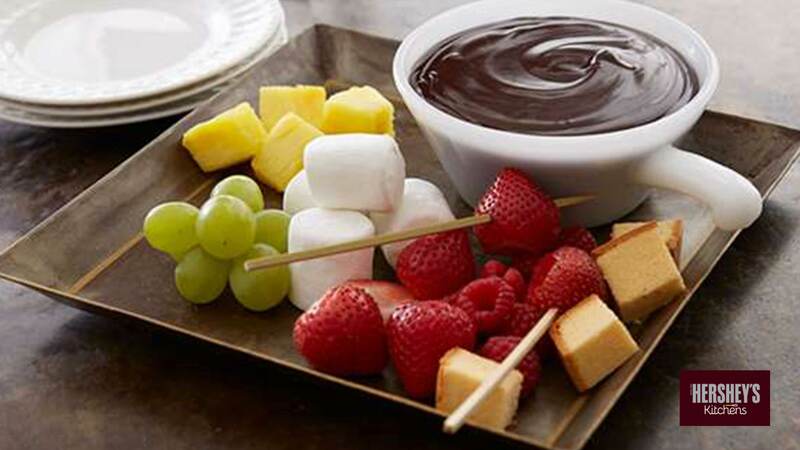 Melt HERSHEY'S SPECIAL DARK chocolate into a rich dipping sauce. Then serve with fresh fruit, cookies, and graham crackers. Place chocolate chips and light cream in medium microwave-safe bowl. Microwave at medium (50%) 1 minute; stir. If necessary, microwave at medium an additional 15 seconds at a time, stirring after each heating, until chips are melted and mixture is smooth when stirred. Stir in vanilla. Pour into fondue pot or chafing dish; serve warm with fondue dippers. If mixture thickens, stir in additional light cream, one tablespoon at a time. Refrigerate leftover fondue. Combine chocolate chips and light cream in heavy medium saucepan. Cook over low heat, stirring constantly, until chips are melted and mixture is hot. Stir in vanilla.